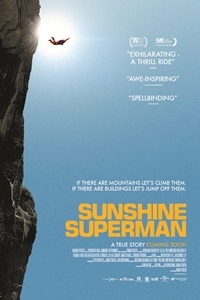 Sunshine Superman: If you build it, they will jump. If everybody else jumped off a cliff, you might not follow suit. But Carl Boenish, the subject of the documentary Sunshine Superman, would still have wanted to share the feeling of it with you, most likely via his helmet-mounted 16mm camera. For the founder of BASE jumping, plunging thousands of feet along a sheer cliff face was a way of “glorifying mankind’s beautiful adventure.” (Why doesn’t anyone talk that way any more?) Boenish found a soulmate in his wife Jean, who found her husband’s avocation “as pleasant as camping” and took the plunge(s) with him. Writer-director Marah Strauch has a wealth of brightly colored, breathtaking material to work from, much of it filmed by Boenish himself, and much of the rest of it featuring him in interviews and recordings (plus the occasional reenactment). The result is as much the portrait of a marriage as it is history of a sport and its founder, and if it occasionally feels repetitive or murky, its moments of magnificence remain undimmed. Matthew Lickona: It says on IMDB that the film’s working title was Gravity. Marah Strauch: At one point, it was called Building Antenna Span and Earth, which is where BASE jumping gets its name. Gravity was one of our working titles, and then Gravity came out and kind of killed it for us. They had the same font we had, and it was right as we were, at long last, getting financing for the film; it was such a blow. So we had a brainstorming session, and I wrote down Sunshine Superman as one possibility, and Universal loved it. And the more I thought about it, the more I liked it: it’s so fitting for Carl. [“Sunshine Superman”] was already one of the songs in the film; that was really important to me, because I felt it was very much the essence of the time and texture of the film, which was set in that ’70s California sunlight. It just made sense to me. ML: It seems that for Carl, the filming was almost more important than the jumping. I was struck by that urge to evangelize: what he wanted most was to share the experience with the world. MS: He wanted to share the joy. I guess you could call that evangelizing. But I don’t think that he ever felt that other people should do it. I think he wanted to inspire people to go out and do things that would be exciting for them in their own lives. 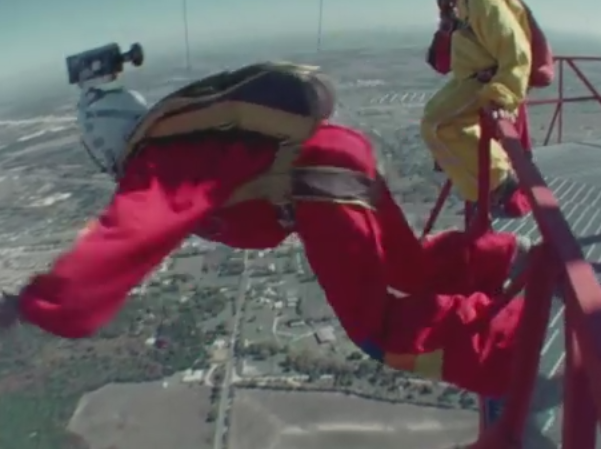 He wanted to show people the beauty of BASE jumping. And you have to put it in context — it really hadn’t been filmed before. He was the first. And when I discovered this amazing footage, I was inspired. And I wanted to share that. ML: How exactly were you inspired? MS: When I first saw it, I just thought it was beautiful. First of all, it was all shot on 16mm film. Now, it’s all about having more pixels and making things more and more clear. But I think that sometimes, seeking clearer images doesn’t necessarily make them better images. I think there’s this really poetic, nostalgic quality to 16mm film that I found intriguing and, to me, the most beautiful way to capture the images. I’d never seen BASE jumping shot in that way — you see it on YouTube and it seems very sporty and aggressive and not something I’d be really interested in. But Carl’s footage was so beautiful. And he also filmed in a really professional way; he took great lengths to get his shots. There’s a scene in the film where he builds a ladder with a seat on the end of it. It hangs out over the edge of a cliff, so that he can get shots of people falling toward him and away from the cliff. That’s telling to me — how important it was for him to get that shot. ML: That scene was gorgeous, amazing, and terrifying for me. But looking at him, I never got the feeling that he thought he was being risky. He seemed to have full confidence in himself and his equipment. MS: Well, he was an electrical engineer, and he had a very analytical mind. Things were very well thought out. MS: Actually, you did. I wanted it to be subtle, but it’s a huge theme in the film. Remember that when he was a child, Carl had polio. And then when he got better, he challenged all his schoolmates to footraces. During his entire life, he had this thing about doing things that pushed physical limitations. ML: And yet, you have Carl talking about how math never fails us. And the decision he made had already been analyzed and deemed unsafe. I was mystified. At another point, he’s talking about God in terms of an abstract “law of the universe.” And then we get him telling those other climbers the story about Satan daring Jesus to jump and let the angels catch him, which is so personal. MS: Yeah, it’s absolutely contradictory. I think a lot of people are contradictory, and I find that more interesting. So I let the contradictions stand. MS: I don’t like the comparison to Man on Wire. I think it’s a fantastic film, but I think mine is really different. They do have similar topics, but mine is really a love story. That was really important to me. Talk about contradictions: in Man on Wire, this guy does this beautiful thing [walking a wire between the twin towers], and then goes and cheats on his girlfriend. ML: Carl and Jean had such an interesting relationship. I was fascinated by her reaction to the news of his death. Right away, she’s thinking about the effect her reaction to the news is going to have. It got me wondering: what was the effect of her reaction? What was the response in the world of BASE jumping? MS: You may ask me about Dean Potter in a minute; almost every person this week has. [Potter, a jumper famous for pushing the limits, had died a few days previous in a jump at Yosemite.] I think that any time there’s a fatality in the sport, it’s really important to the community that they’re representing it in the right way. Carl was the person who invented this activity, and I think it freaked people out. I think Jean’s choice to remain strong and solid in this activity that they had developed was amazing. And I think it was the right choice. It was important for her to learn what went wrong, so as not to repeat the mistakes. Part of her job was to act as an investigator, because nobody else who was there really understood the actual parachuting equipment. She needed to understand what went wrong from a technical standpoint. ML: What did she find? MS: It wasn’t a good cliff to jump from. And also, his parachute was packed for a higher cliff than the one he jumped from. People sometimes make mistakes. He made a mistake.